It's great when your immune system army attacks and destroys dangerous invaders. Otherwise we would never survive. But sometimes the immune system makes mistakes. It confuses a harmless thing with a dangerous thing. And that's when allergies happen. For example, many people are allergic to pollen from flowers. There are lots of different kinds. You can see some of them in this picture! Touch the picture to find the ragweed pollen. Lots of people are allergic to that! Pollen, all by itself, is not dangerous! 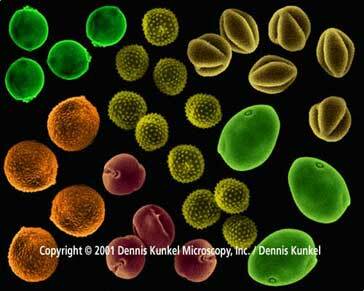 We all breathe in thousands of tiny particles of pollen. But when people are allergic to pollen, their immune cells mistake pollen for an enemy! The immune army multiplies rapidly! The cells attack! They squirt out powerful stuff to destroy the enemies! The immune system is out of control! There's a problem! The powerful stuff that cells make to kill enemy invaders can make a person uncomfortable! Especially when there's too much of it. Stay away from the things we are allergic to. These things are called allergens (al-er-jens). Sometimes that's easy. If we're allergic to certain foods, we just don't eat them. Sometimes it's not so easy. If there's pollen in the air, we can't stop breathing! Medicines can help. They can keep the immune system from getting out of control. For some allergies, doctors can "teach" the immune system not to attack the allergens. They give the allergic person very tiny amounts of what he or she is allergic to. The immune system begins to accept the allergen and stops putting up a fight!